The problem with developing a video game is: Sometimes you need to stop. Even when you’re not totally happy with your final act. This week on Kotaku Splitscreen, we discuss all that and more. First, Kirk and I talk about the appeal of Dead Cells, the problems with video game grind, and Diablo III coming to the Switch. 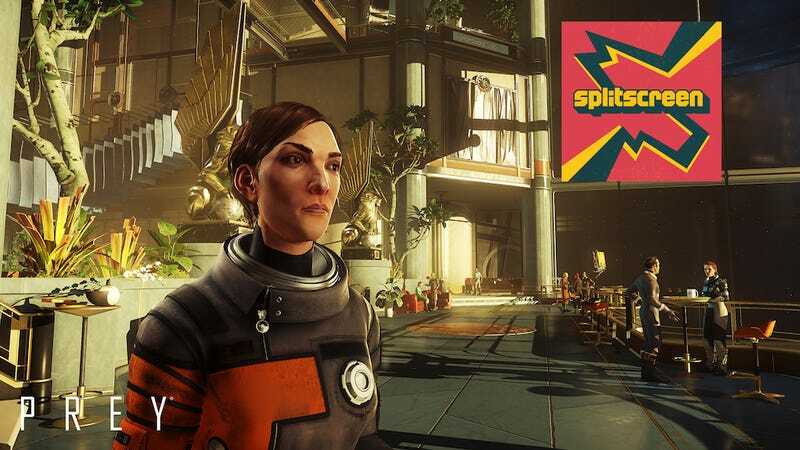 Then, Arkane co-founder Raphael Colantonio joins me for a fascinating chat about the video game industry, crunch, Prey’s strengths and flaws, and much more. Colantonio, you may remember, wrote the now-infamous e-mail calling me and other reporters “press sneak fucks” back in 2013. With him departing Arkane last year—and therefore, being free of Bethesda’s PR, who have blacklisted Kotaku for nearly five years—he and I were able to get on the phone and mend fences earlier this year. So I’m thrilled to have him on our podcast this week. Jason: I think every developer says that. Colantonio: There are some economic realities behind it. We had been developing the game for a while. There’s a moment where you book the shelves, because that’s also part of the ecosystem of our activity is that you have to book shelves at the retail stores. So once it’s there, you cannot tell them at the last minute, ‘Oh by the way we’re going to delay the game.’ There’s an entire chain, an entire organization. So it’s not just money, it’s a full thing, at some point when you’re committed, you’re committed... We have so much momentum, so much inertia when we do things, that there’s a moment at the end when you just have to wrap it up. Jason: Did you try to delay Prey? Colantonio: We did delay Prey a little bit compared to the very initial date we agreed on. There’s a moment when you can, because there are staged gates when you develop a game... There’s the prototype, vertical slice, alpha, beta, etc. Mid-game, there’s still time to delay the game if you have to, and Zenimax was really good with that. They were good with evaluating the game together with the developer and making the decision that makes sense for the game. Jason: So when you guys got to those last three months, was that something you specifically brought up, that final act being too much action, too intense? Was it something you discussed but realized you couldn’t change? Colantonio: Yeah absolutely, it was a recurring theme, the feedback was very clear. We have to accelerate the end just because it’s too intense, not that fun. If you had played the version we had a month before that, you would have thought it was even worse. Colantonio: Yeah, again, I think creators are never fully happy with what we do, and there’s tons of things that we wish we had done a little differently, but it worked out. Given how hard it is to make games. Prey was a very rich game, there was tons of things in there, tons of things that layer on top of each other, so I think it worked out in the end.